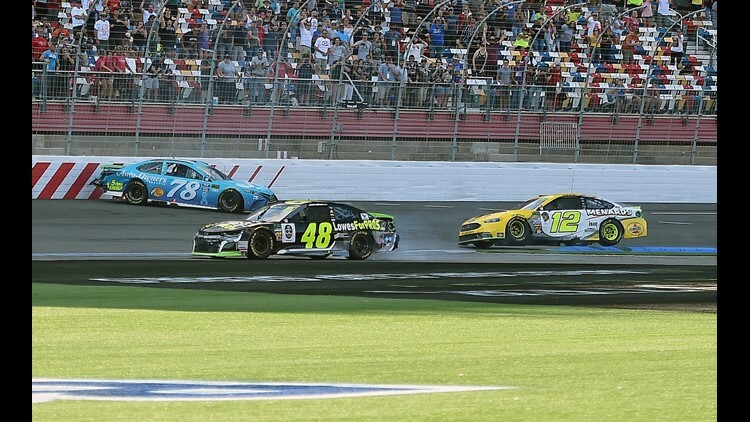 CONCORD, N.C. (AP) — Ryan Blaney won the debut race on the "roval" at Charlotte Motor Speedway in a chaotic finish in which he slid past leaders Martin Truex Jr. and Jimmie Johnson when they wrecked racing for the victory. Johnson, who wrecked while trying to snap a 58-race winless streak, was eliminated from NASCAR's playoffs. The seven-time Cup champion has struggled all season and headed to Charlotte, where he'd won eight points races on its traditional speedway, below the cutoff line for NASCAR to trim the playoff field from 16 to 12 drivers. Johnson would have made it into the second round if he'd simply followed Truex across the finish line. Instead, he tried to dive inside and pass Truex for the victory with two turns remaining and he ended up in a spin. Johnson collected Truex, who spun off course, Johnson's car came to a stop and Blaney scooted past for the surprise victory. Johnson wound up eighth and in a three-way tie with Kyle Larson and Aric Almirola for the 12th and final spot in the standings. He failed to advance on a tie-breaker, which wasn't decided for several minutes as NASCAR reviewed the final sequence. Johnson stood patiently next to his car and awaited the updated standings. Denny Hamlin and Erik Jones, teammates at Joe Gibbs Racing, were eliminated from the playoffs along with Daytona 500 winner Austin Dillon. Almirola was out of the playoffs until the final laps when he passed three cars to collect the points needed for the dramatic tie. His final point gained came in the final turn of the race. "I felt so helpless so many times this weekend and I just kept telling myself, 'Survive, survive,'" Almirola said. Charlotte revamped its track to add excitement to its boring 1.5-mile oval and the outcome was a hybrid track of the speedway and a road course through the infield. The race was much cleaner than expected after two crash-heavy days of practice, but action picked up in the closing laps. Brad Keselowski was on track to win for the fourth time in five races until he misjudged the entry into the first turn on a restart with six laps remaining. It triggered a multi-car accident that also collected Kyle Larson. Keselowski had led 29 laps, Larson had led 47 and either was a solid bet to win the race. Instead, Keselowski's race ended and Larson had to limp a wounded race car around the track for the final laps to cling to his spot in the second round of the playoffs. Larson's fate was also determined in the final few turns when he passed the stalled car of Jeffery Earnhardt. "I couldn't even drive my car it was so destroyed," said Larson, who was married last Wednesday to get the ceremony done during the season. "He was like 100 feet from the start/finish line and I could see him (Earnhardt) creeping and I was like, 'Don't go, don't go!'" That led to the final restart with three laps remaining and Johnson used all three of those laps to try to win the race, which cost him a chance this year at an eighth title.